Stuart Anderson is both sculptor and foundry man, casting all his own work. He has an extraordinary understanding of the alchemical properties of bronze, which informs his modelling. 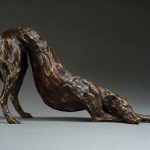 He studied at Winchester College of Art and then did a masters in bronze sculpting at the Royal College of Art and built his first foundry in his parents back yard in 1991. From 2000 – 2005 he travelled and worked in South East Asia learning about the ancient foundry techniques of the region. 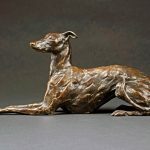 A figurative sculptor, Stuart admires classical cannons of grace and proportion yet brings his unique observation to his animal and figure forms. While individual and representational they have an inner grace and sense of harmony, rhythm and proportion. With his understanding of anatomy he has the ability to turn these forms into compositions of fluid beauty. He is a master modeller, working directly in clay from his subject, the form coming to life in his hands. He has a special affinity with horses and greyhounds as subject matter. 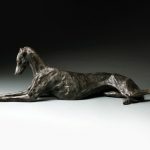 His greyhounds in particular are essays in the sheer joy of natural rhythms of line and form and his horses are a metaphors for the forces of nature, in all its power and beauty. 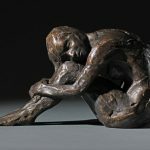 Stuart’s awards include the Henry Moore Foundation Grant,Voya Kondik Trust Grant and the Angeloni Award for Bronze Casting. 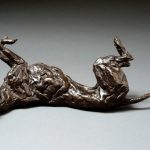 He has exhibited in Europe, America, The Far East and throughout the UK including the Royal Academy and St James’ Park Summer Shows.